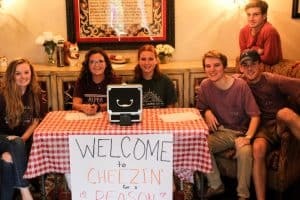 Lambda Chi Alpha has been in a giving mood this semester, holding their first annual Cheesin’ for a Reason philanthropy with the ladies of Alpha Gamma Delta. The event brought together nearly 300 people from around the Ames Greek Community to the event at the Alpha Gamma Delta chapter house at 2118 Sunset Drive. 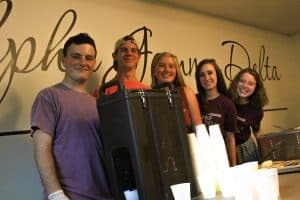 The chapters worked together to serve grilled cheese, tomato soup and cookies to all of the hungry guests. The Lambda Chi Alpha brothers raised $710 which will be donated to Feeding America, the international philanthropy partner of Lambda Chi Alpha.